Here is the final part of the document outlining the way climate change will be taught in our classrooms. 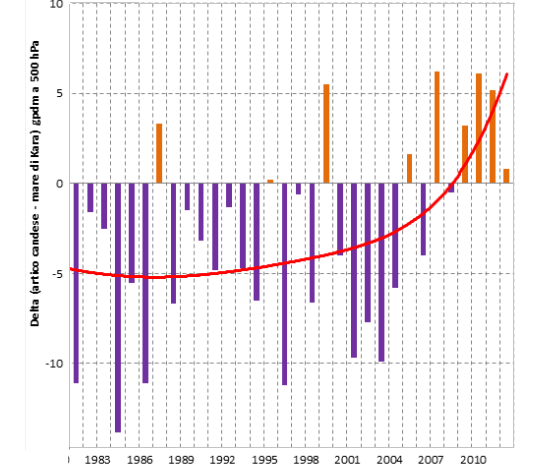 In part 1 we saw some extraordinary claims about the rate of ice melt on Greenland – gone in 50 years. In part 2 we saw how the syllabus will be organised in England, Wales and Scotland. Here we move to experimental work, with two demonstrations. Words fail me, so I’ll let you look for yourself and provide some critique in comments on the suitability of these ‘practical science lessons’ for training young minds after making them fearful of ‘man made climate change’ caused by ‘radiation from greenhouse gases’. 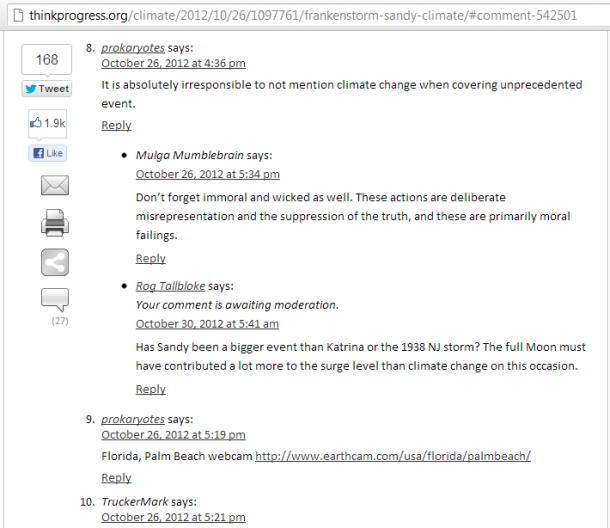 Over at Joe Romm’s blog ‘TP’, they’ve been working themselves up into a froth over Tropical Storm Sandy. So I offered some wisdom to pour oil on troubled waters counter their drivel. It was a pretty innocuous comment I thought, but it has been censored anyway. Here are the before and after screenshots. My thanks to Nicola Scafetta for pointing out this page of the most downloaded articles at science publishing house Elsevier’s title ‘Journal of Atmospheric and Solar Terrestrial Physics. Our Solar-Planetary Theory is gaining traction. It asserts that the Sun is a more significant climate driver than human emitted trace gases and aerosols and that the motion of the planets and other solar system phenomena are linked to solar activity levels and climate change, also via effects on Earth’s geomagnetic field, magnetosphere and upper atmosphere. Over half of the papers listed are connected with these areas of interest. 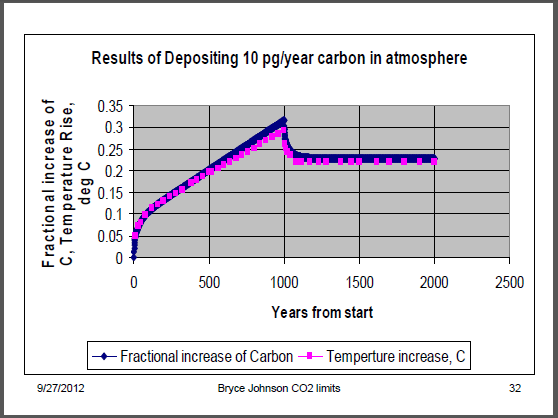 Notable by their absence are the words ‘carbon dioxide’ and papers strongly pushing the AGW meme. The great climate paradigm shift is underway at the cutting edge of science demonstrating a marked shift from the situation a few years ago, when the Anthropogenic Global Warming theory ruled the roost, and the journal Nature didn’t publish a single solar paper for five years between 2005-2010. Abstract: Relations between the length of a sunspot cycle and the average temperature in the same and the next cycle are calculated for a number of meteorological stations in Norway and in the North Atlantic region. 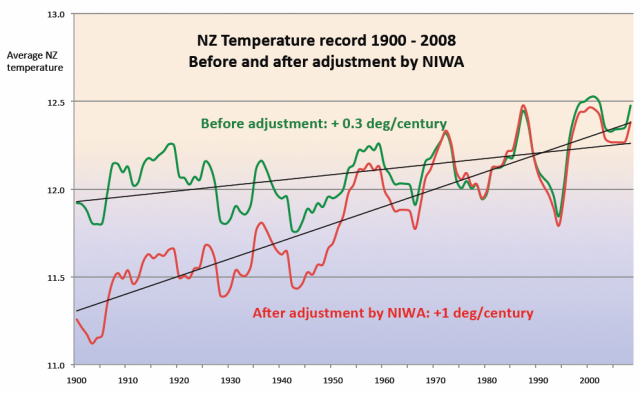 No significant trend is found between the length of a cycle and the average temperature in the same cycle, but a significant negative trend is found between the length of a cycle and the temperature in the next cycle. 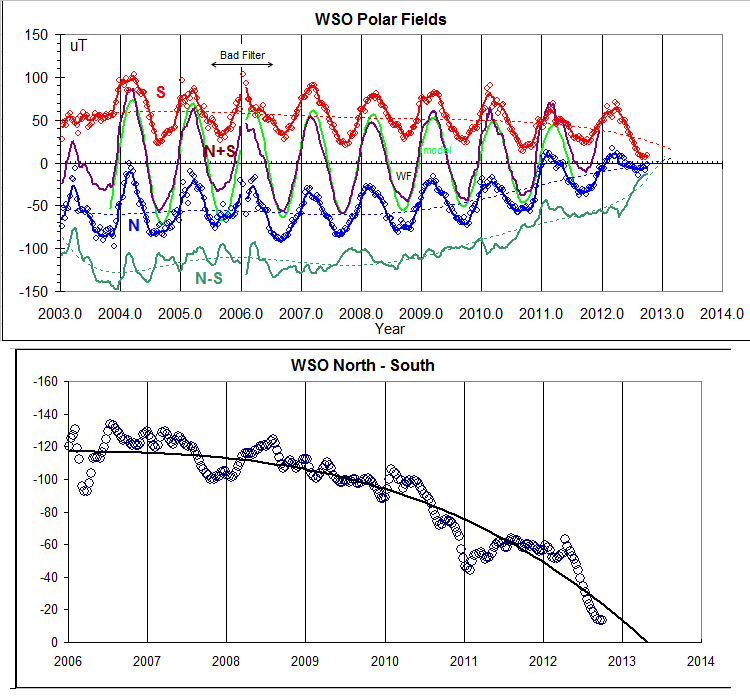 This provides a tool to predict an average temperature decrease of at least 1.0°C from solar cycle 23 to solar cycle 24 for the stations and areas analyzed. We find for the Norwegian local stations investigated that 25–56% of the temperature increase the last 150 years may be attributed to the Sun. For 3 North Atlantic stations we get 63–72% solar contribution. This points to the Atlantic currents as reinforcing a solar signal. In Suggestions, Michele has drawn attention to a correlation found by two contributors to the Daltons Minima website in Italy he runs. The following translation is from Google, and is easy to follow. While I think that performing a Pearson correlation between 4th order polynomials is… an interesting technique, 😉 I do think they are onto something here – Note how the Arctic Dipole goes positive at all the solar minima they examine. Bravo Richard and Zambo! In the appointment earlier we learned about this new scheme circulatory, characterized by a dipolar structure and therefore known as pattern Artctic Dipole. This is measured by an index that corresponds to the pressure gradient between the boreal Siberian (centered on the Kara Sea) and the area Canadian-Greenland (DA index.) In short, when there is a strong episode DA +, circulation on the pole (in general on the whole northern hemisphere), undergoes a radical change, with a strong acceleration of the southerly winds of Pacific origin and an increase in northerly winds on the Atlantic-European. This fact leads to a dramatic increase in heat fluxes peaceful directly on the pole, resulting in acceleration of the melting rate of the summer Arctic sea ice. Finally, we have seen the results of experimental studies (PIOMA model in the first place), in which unequivocally demonstrate that the orientation and magnitude of the DA + pattern is the key to understanding and predicting the decline of sea ice in the Arctic basin. In the third and final part of this paper we try to identify the phenomena that govern the evolution and intensity of the DA pattern, and consequently of Arctic sea ice in summer. • Climate is the synthesis of the weather over a long period of time. • Climates change over long periods. • Pollution has an effect on climate change. • Saving energy will lower the effects of climate change. • Level D: describe how extremes of weather and climate can disastrously affect people and places. world, including extremes, and explain the effects on ways of life. Over on the Carbon Flame war (which I hope to be contributing to again as soon as Ryan fixes the software), Doom-laden Dan Mchale links to a post on a climate alarmist site calling itself ISIS – the Institute of Science in Society. ISIS is actually the name of a history of science journal which has been in existence for a very long time. I could hardly believe my eyes as I read this document from a supposedly reputable UK ‘science based’ agency. This is what people in positions of high trust and high public pay want to push into the minds of youngsters in Britain’s schools. The whole thing needs a thorough debunking, which we’ll undertake over a series of posts. When we’ve completed it, with references to scientific papers and the on the record statements of scientists, we’ll deliver this to the agency involved and report their response. Here’s the opening section. • Is the climate changing? • What has caused the climate to change? • How much do we expect the climate to change in future? scientific consensus on climate change, its likely impacts and what we can do about it. Centre for Climate Prediction and Research. My other half texted me at 9.30pm last night from Durham, where she is visiting family, to tell me it was snowing heavily. I noticed the guys at the local railway station had been gritting as I got off my train too. At lunchtime she emailed me one of the pictures she took this morning. 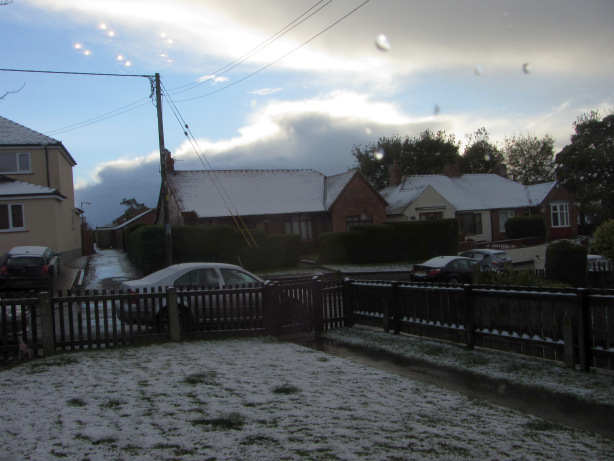 Snow at valley level before the clocks go back is fairly unusual for the UK. The first snow and the end of summer time both mark the onset of winter this weekend. Scotland and parts of the East Coast had a dusting of snow today and tomorrow more is expected, significantly earlier than last year when the first flakes were not seen until December. The Local Government Association (LGA) said that hundreds of gritters are on standby to treat roads as required. The first real cold snap of the season meant that night-time temperatures were expected to be below freezing in many areas last night, although after tonight they may be back to more normal levels. But cloud and rain will remain. My Thanks to Bryce Johnson, a U.S. American nuclear physicist, who delivered an in depth talk in May to the N. Cal section of the American Nuclear Society, for sending in a pdf of his accompanying powerpoint presentation. For those who are already familiar with spectral calc and who want to skip the intro sections on radiative curves, I recommend review of slides 31-52 where the fun really begins. 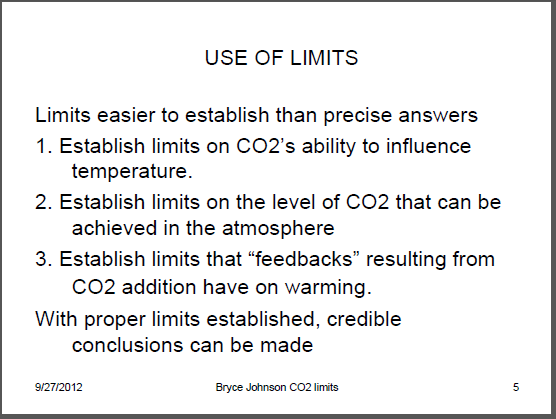 Hopefully Bryce may find time to join us in discussion to elucidate his findings, which are based on conservative parameters, to give the co2 warming theory the best possible chance. It’s eye opening stuff, especially on the max warming co2 alone can create and the non-event water vapour feedback. I’ve reproduced a few of the slides below to whet the appetite. That there were significant “commercial interests” involved. “The original hypothesis was that the data had been taken by a person or persons unknown ranging from an individual acting alone to an organised group engaged in espionage or offences linked to terrorism and potentially linked to foreign governments and/or organisations with significant commercial interests. Whilst the terrorism element quickly receded the other elements of the hypothesis remained current throughout the investigation. There are significant political and commercial influences surrounding the climate debate, which include oil producing nations such as Saudi Arabia, emerging economies such as China and existing major economies such as the USA and Russia. 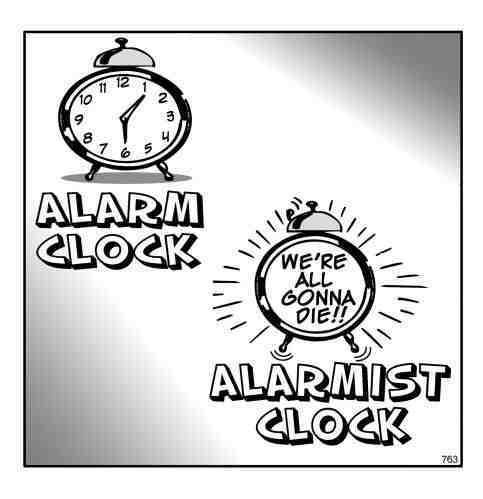 Alongside the political and commercial intereststhere exists a global network of climate change sceptics who variously believe that climate change is not happening or if it is, that mankind is not responsible. Because of the long intervals over which the sunspot number data are smoothed, there is a possibility that solar cycle 24 maximum occurred last February, 2012. Ironically, Feb, 2012 was an unsmoothed monthly minimum, both in SSN and F10.7. 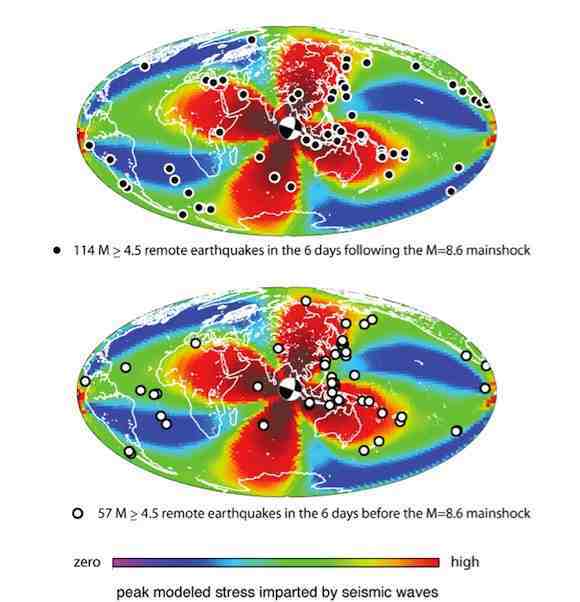 Another possibility is that there will be a second, higher, smoothed peak occurring later in 2012 or in 2013, close to the expected time of solar magnetic pole reversal. When Germany’s power grid operator announced the exact amount of next year’s green energy levy on Monday, it came as a shock to the country. Here is an important step forward in the progress of the Solar-Planetary theory. Some big names in the paleo-proxy field are starting to get behind this now. Beer, McCracken and Steinhilber and Ferriz-Mas are all co-authors on this new paper published in Astronomy and Astrophysics. The great news is that it is open access so well done AandA! No need for me to spend ages formatting the paper’s relevant plots and text, just click and download for discussion. 2 Eawag, Swiss Federal Institute of Aquatic Science and Technology, Postfach 611, CH-8600 D¨ubendorf, Switzerland. 3 Departamento the Fisica Aplicada, Universidade de Vigo, Spain. 4 Instituto de Astrofisica de Andalucia (IAA/CSIC), Granada, Spain. 5 University of Maryland, USA. 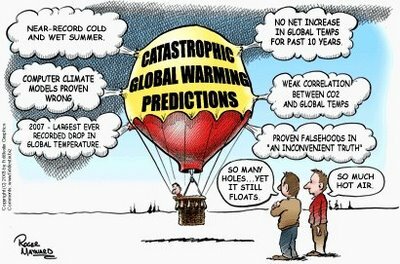 Short term natural variability in local/regional climate/weather has always far outstripped long term global variability. So a small increase in global temperature won’t make much difference to the decadal variability in precipitation and temperature where you live. 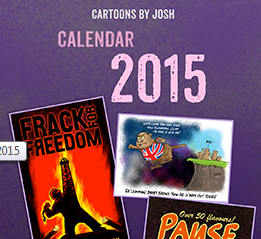 Over the centuries, there have been quieter and wilder weather periods, floods and droughts, all perfectly natural. We are at a climate inflexion point with the major oceanic oscillations and some more variable weather will result as the system settles into the new regime for the next 30 years. It was the same in the 70’s as the 30 year cooling gave way to the 30 year warming as the Atlantic and Pacific multi-decadal oscillations changed sign. Citation: Vásquez-Bedoya, L. F., A. L. Cohen, D. W. Oppo, and P. Blanchon (2012), Corals record persistent multidecadal SST variability in the Atlantic Warm Pool since 1775AD, Paleoceanography, doi:10.1029/2012PA002313, in press. On looking GWPF, broken link, figured and reported it, pulled the small dataset. Odd moment thing is tell software here to go do a quick look, only takes a few seconds, and see what gives.